Unmatched Protection from a ‘Bullet Proof’ Guard Booth | BIG Enterprises Inc. When searching for the strongest and most reliable guard booth on the market, thousands of people are directed to B.I.G. Enterprises, Inc. by using the search term “bullet proof.” Although this company offers a wide range of guard stations designed specifically against high-level attacks, no one on the planet can technically manufacture a booth that is bullet proof per se. Without question, a bullet proof guard booth is essential for many applications. 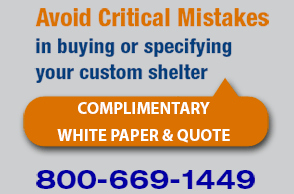 Based on design, a booth of this type is made specifically to provide optimal protection. For this reason, it is common for government facilities to seek security booths with bullet proof capabilities manufactured by a top-rated company, such as B.I.G. This company has spent more than 50 years performing in-depth studies on different types of guard booths along with varying types and levels of threats. As a result, one of the company’s most efficient security stations was custom designed. Known as the Discovery Center, this guard booth offers bullet-resistant strength and superior fit and finish. In addition, this guard booth is designed according to strict blast- and bullet-resistant requirements that are seen by some as “bullet proof” to specific levels. For many government sites responsible for handling sensitive documents and operations, a bullet proof guard booth, in the sense of being able to deflect even high-powered ammunition, is the first line of defense. Based on the design of the booths manufactured by B.I.G., security personnel gain a huge physical advantage over possible threats while being able to work in a comfortable environment. At the request of a large developer of classified government facilities, B.I.G. designed the Discovery Center. Taking every possible factor into consideration, a unique and innovative security station that is extremely tough was devised. However, as it is prefabricated, this guard booth is affordable and easy to set up after reaching its destination. Due to security demands for the Discovery Center, B.I.G. took no shortcuts in design or development. With this guard house, security personnel are provided with 240 square feet of aesthetically pleasing workspace. After being built in the B.I.G. factory, the guard house is thoroughly prepped and then shipped as a single unit. Once on-site, the guard house can easily be customized with an arched roof, granite exterior panels, overhang, and more, according to preference.